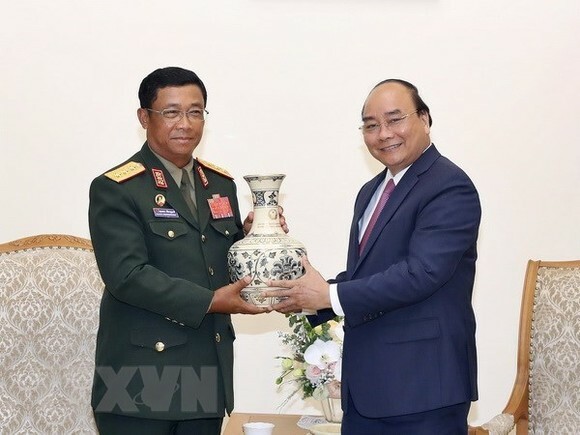 Prime Minister Nguyen Xuan Phuc hosted a reception in Hanoi on May 14 for Sen. Lt. Gen. Suvon Luongbunmi, Deputy Defence Minister and Chief of the General Staff of the Lao People’s Army, who is on an official visit to Vietnam. PM Phuc highlighted the profound relationship between the two Parties, States, armies and peoples, noting that throughout history, the Vietnamese army and people have always stood side by side with their Lao counterparts in all circumstances. Sen. Lt. Gen. Luongbunmi briefed his host about the outcomes of his talks with Sen. Lt. Gen. Phan Van Giang, Deputy Defence Minister and Chief of the General Staff of the Vietnam People’s Army. The two sides reviewed cooperation in 2017 and discussed concrete cooperation orientations for this year and the time ahead, he said, elaborating that the two defence ministries worked together in all aspects last year. Notably, the Vietnamese Ministry of National Defence has actively helped the Lao army to build forces, thus greatly contributing to the socio-economic development of Laos. The two sides have also carried out a number of joint activities to improve living standards of residents in their countries’ border areas, which has been strongly supported by Vietnamese and Lao people, he noted. In the coming time, they will increase collaboration in personnel training and building the Vietnam-Laos boundary into a border of stability and comprehensive development, the officer said. Applauding the two defence ministries’ cooperation, PM Phuc asked them to enhance connections to help intensify the countries’ friendship. Meanwhile, he said, as Vietnam and Laos share a long borderline which mainly traverses mountainous and disadvantaged areas, the countries should step up joint activities between their armies and security forces to maintain peace, security, order and friendship along the border. The PM voiced his belief that the fine relationship between the armies will fortify the trust and all-round cooperation between the two Parties, States, and peoples while ensuring peace, stability and political security for each country’s development.